That's a weird feeling, writing the number 1000 up there. This, however feels just right as a must hear album: it's the one where Bob Dylan put his electric ambitions on wax, it's his first US top ten album, and it's been an influence on a truckload of people - just about everyone. Whether it's Radiohead giving a nod to Homesick Subterranean Blues on their Subterranean Homesick Alien track or The Specials, perhaps unwittingly, putting Maggie's Farm in the context of Maggie's Thatcherism destroying the UK at the time, or The Byrds getting their break with Mr. Tambourine Man. 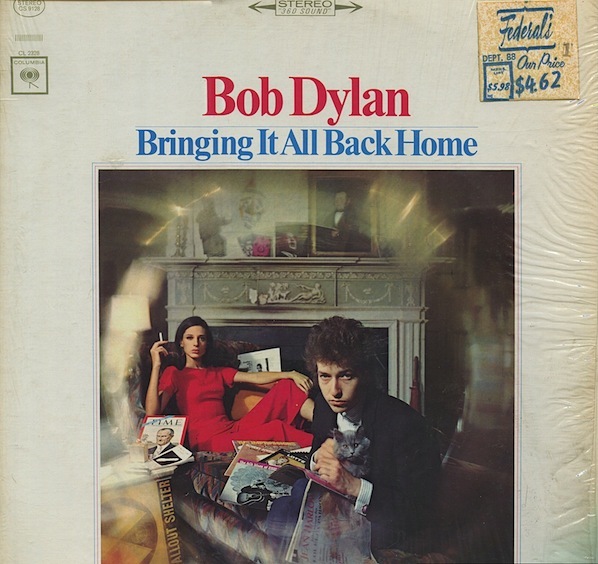 Bringing It All Back Home consists of a bunch of good songs, with Bob's voice holding up, and he's reinventing himself, so kudos, dude. Half the album's with a plugged-in and amplified band, and half the album's pretty much just Bob unplugged, and we can hear the difference not just in the fuzz, but also in the lyrics: on the A-side it often goes into comedic stuff (e.g. Bob Dylan's 115th Dream and similar) while on the B-sides acoustic it's the folk that he was moving away from (e.g. It's Alright, Ma (I'm Only Bleeding)). But his old fans still weren't happy, though. Another thing I hear is in Outlaw Blues: the line "She's a brown-skinned woman, but I love her just the same" - nice sign of the times there, dude. Fresh and clean.